Ice Lolly Tubes by Indevco Sal. Supplier from Lebanon. Product Id 548056. For packing frozen popsicles, request a quote for ice lolly tubes. Ice lolly squeezers are available with 70, 80, 110 and 120 ml capacities. We are also producers of ice cream cone sleeves and ice cream paper cups. 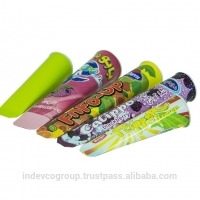 Ningbo Empire Packaging Co. Ltd.
Search More Like "Ice Lolly Tubes"